Mobile X-Ray is the leader in portable digital radiography. Our portable top-of-the-line equipment provides digital images that can be viewed instantly on a laptop. Digital radiography, in comparison to computerized radiography (CR) and X-Ray film, provides the best possible images for the radiologist to read. 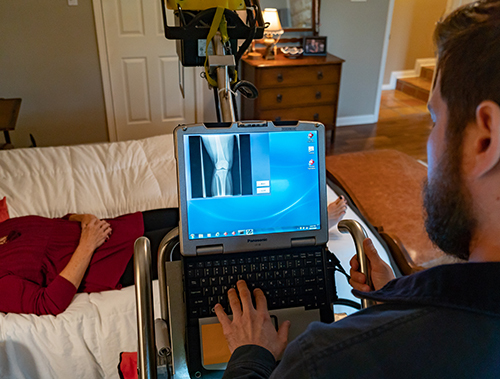 Digital X-Rays use digital sensors instead of traditional photographic film, eliminating chemical processing and offering time savings plus the ability to digitally transfer and enhance images for a clearer quality. Patients and staff are exposed to substantially less radiation than traditional film X-Rays, and it is better on the environment because chemical developing is not required. With digital imaging bedside capabilities, our software allows the technologist to present crisp, optimal imaging for interpretation by our team of Board-certified radiologists. The images appear instantly on the monitor for the technologist to view, ensuring top quality control. Using only a single imaging plate also greatly reduces exam time and discomfort for your patient.